Watch this page for progress reports and calls to action. With your help we surpassed our goal and generated over 60 letters of support to the California Assembly Committee on Agriculture for AB 2385 by our deadline of April 22, 2014. Thank you!!! The Committee hearing for the bill will be on April 30th in the afternoon. If we win the vote in the Ag Committee it is on to the Appropriations Committee. We will keep you apprised of progress and let you know if we need you to call or write members of the Legislature. Sponsored by Roots of Change and authored by Assembly Member Phil Ting (San Francisco), AB 2385 creates the Market Match Nutrition Incentive Program within the California Department of Food and Agriculture. This program will provide grants for farmers markets and potentially other direct producer-to-consumer venues (CSA, farm stands or corner stores) that are helping low-income people to afford healthy, fresh fruits, nuts and vegetables. The proposed program builds off two platforms for change. First, a pilot Market Match program serving 37,000 families and nearly 900 farms selling produce in 140 markets across the state, which ROC launched with fourteen partners in 2009. The other is a new federal Farm Bill provision called the Food Insecurity Nutrition Incentive program that could provide California with as much as $2 million a year in grant funds if we can generate the required matching funds from within our state. AB 2385 is step toward ensuring California can draw down the federal money using public and private sources. Markets participating in the Market Match program provide nutrition benefit clients using SNAP (food stamp), SSDI, SSI, WIC or Senior Farmers Market vegetable vouchers with an incentive to buy healthy fruits, nuts and vegetables. For example, if a SNAP recipient spends $10 from their Electronic Benefit Transfer (EBT) card, the farmers market gives them an additional $10 in Market Match funds. The low income shopper doubles their purchasing power. That is good for the health of the shopper’s family and it is also good for the small farmers working the markets who sell more produce. In January 2013, ROC passed leadership of the Market Match program to our key partner, Ecology Center, which is now working to take the program to all 800 certified farmers markets in California. ROC is focused in supporting that expansion through policy change in collaboration with members of the CA Food Policy Council and nonprofits from across the nation. 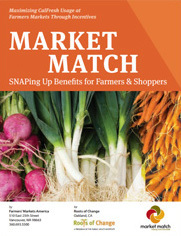 We hope you will agree that by connecting low-income shoppers and small farmers through Market Match all Californians benefit. Our state’s most vulnerable families are healthier (thereby lowering healthcare costs for us all) and our local farmers who are the foundation for resilient local food systems become more economically sound. Contra Costa Certified Farmers Markets Inc.
Error: Error validating access token: Session has expired on Tuesday, 26-Mar-19 12:54:16 PDT. The current time is Sunday, 21-Apr-19 07:41:32 PDT.